Each winter I shift my primary operating from QRP in the Park to Boat Anchors in the Basement. 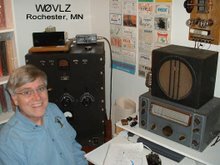 Two of my favorite winter operating events are the AWA Bruce Kelley 1929 QSO Party and the AWA Linc Cundall Memorial CW Contest. Both of these focus on boat anchors running on 160, 80 and 40 meters. My permanent shack antenna is a trade off at best. I don't have a good way to get much height. For the past several years I've played around with a temporary/winter vertical. fiberglass tubing plus a 5' whip as a 40 meter quarter wave vertical. It is attached to the deck railing at the 9' level and guyed at 24'. 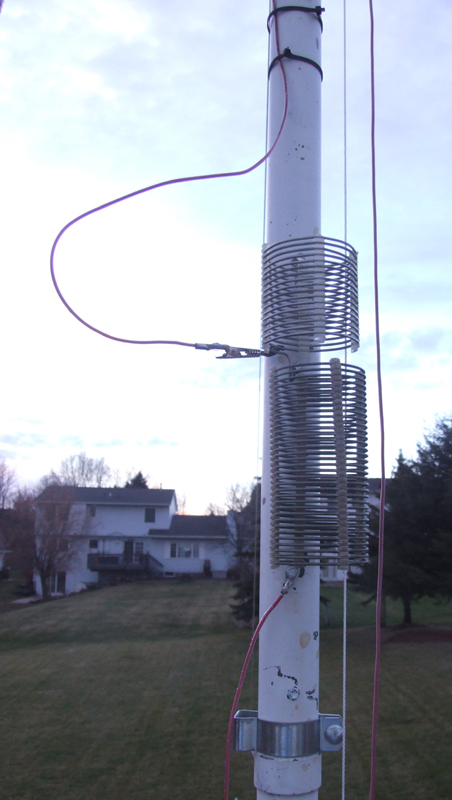 I added a loading coil at 13' to get it resonant on 80. This coil is bypassed for 40 meter operation. SWR shift as I held the key down. In addition this loading shift really ruins my 29 transmitter tone/signal. 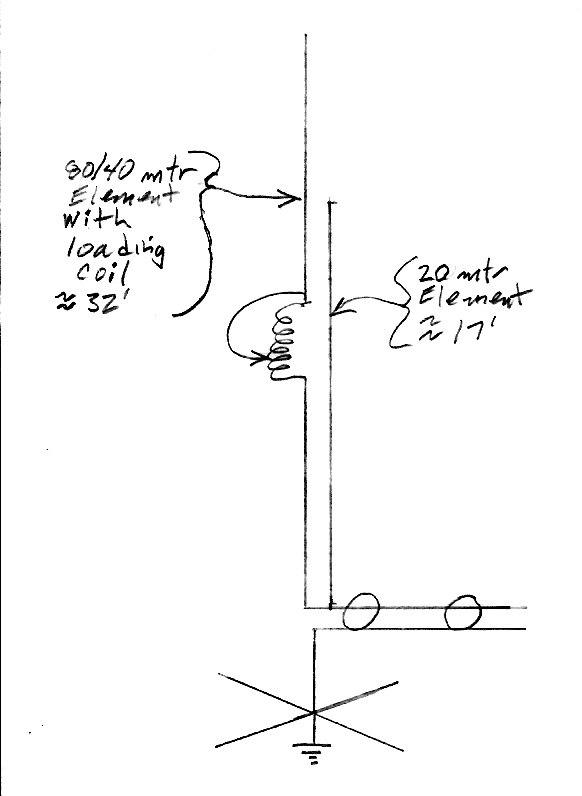 Solution: remove the 20 meter element. My winter vertical works fine on 80 and 40 meters, perfect for the AWA operating events. rope and pulley attached at the 24' level. For the last two weeks of December and the first days of January my vertical is re-purposed for Christmas decorations. 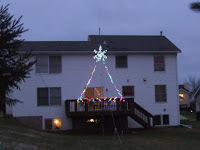 We run a lighted star up it with an attached "tree" of lights. Yesterday it was sunny and the temperature reached 70 degrees, almost 20 degrees above normal for this time of year. Looking at the forecast it looked like this might be one last warm day until next spring. I felt a picnic table calling my name. Beth picked up lunch at our local KFC while I set up my KX3 and 20 meter zepp at Silver Lake Park here in Rochester. The Reverse Beacon Network showed that conditions were not that good. Only one skimmer gave me a two digit signal report. After going through the effort of setting up I went ahead and called CQ. The couple of hours on the air/eating lunch/enjoying the weather and company netted me three contacts, about average for me on one of these local QRPxpeditions: WB3AAI/4 / Florida, KF4CLO / Texas and KC2ICA / New York. QSB up and down was the norm for the day. It was neat, though, that KC2ICA was running only 1 watt to a random length wire. That was just 28 miles short of 1000 miles per watt. Time now to crank up the heat a little and switch over to winter operating ... Boat Anchors in the Basement. Stevens Point in central Wisconsin. Of course my KX3 bag was one of the first things in the car. My operating style is never highly competitive ... I find a picnic spot with a handy tree (and, maybe, a good view), setup and then call CQ while checking the reverse beacon network to see if anyone might hear me. During this trip I was on both 20 and 30 meter CW working both coasts and as far south as MO. Along the way I also got to talk about ham radio to curious passers-by that happened to notice the wire in the tree and the techie looking gizmo on the table. I've finished my 1T4 / 3V4 Regenerative Portable. Along the way I found Dave's "Regenerative Tube Radio Building Notes" at http://makearadio.com/misc-stuff/regennotes.php . 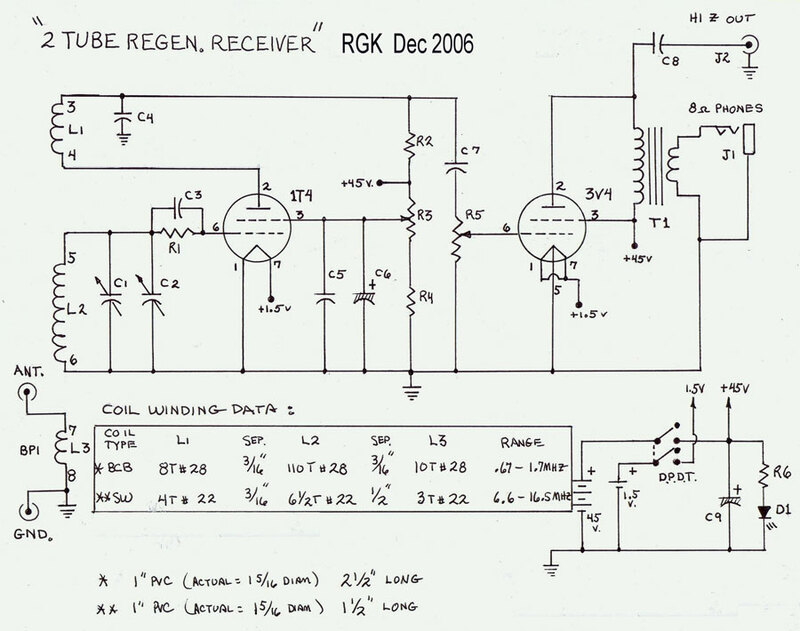 Dave condenses down to a few pages a lot of the information that you need to know about regen receiver design/options without spending a lot of time on theory. It fits his philosophy of "No big theory discussions or math here. You are here to build a radio, not to earn your college degree." This was helpful as I made design changes to fit parts available. The first parts constraint I (didn't) find was a small bandspread capacitor. What I had was one in the range of 10-35pF and I was looking for something around 3-10 pF. A 10 pF fixed capacitor in series with my 35 pF bandspread capacitor got me the bandspread I needed without modifying my capacitor. Next, the original design from Bob's Data had both low and high impedance outputs. I'm only using high impedance headphones so I replaced the 10K to 8 ohm output transformer with a 3:1 inter-stage coupling transformer. I had also hoped transformer coupling to my headphones would increase the volume...that didn't happen. More on this later. I also decided to add an antenna coupling control. I'm not certain this helps a lot but it may come in handy when connected to a long/resonant antenna. Finally, all of Dave's feedback control options show an RF choke in the B+ line going to the tickler coil. This seemed like a good idea. It keeps the feedback RF all at the coil rather than wandering around the chassis. Bob's design information included coil winding documentation. I had a set of pre-wound 1930's vintage Hammarlund 6 pin shortwave coils. I used these rather than wind my own coils. The final radio looks good and nicely covers 80 and 40 meters. I have several sets of high impedance headphones that I've acquired over the years. My Neufeldt & Kuhnke Model D headphones gave the best volume. 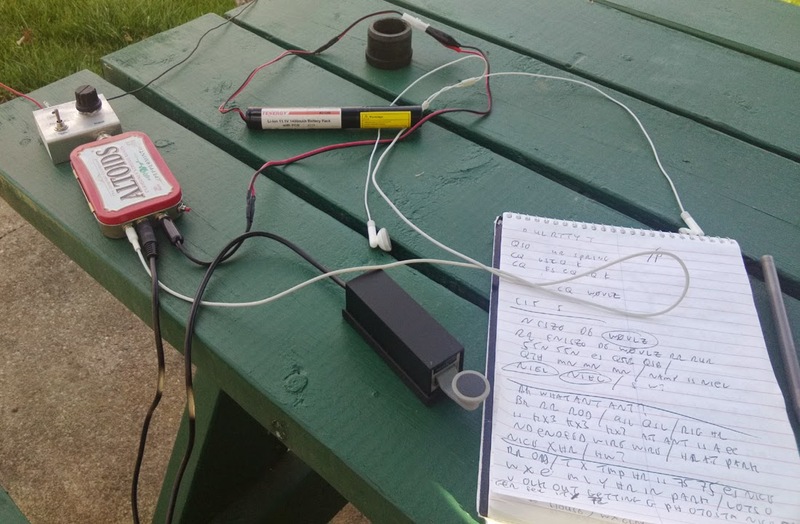 This is a battery set designed for A/filament voltage from a flashlight battery and B+ from a series of 9V batteries. I used my 20s battery set power supply from Antique Electronic Supply. This power supply provides the regulated A and B voltages that I needed. See https://www.tubesandmore.com/products/K-101A . I'm a little disappointed in performance but this is a 1940s/1950s starter set. Maybe this is a good as it gets. Volume is low and the regeneration setting is tricky. When regeneration is set for maximum sensitivity I feel like I'm riding the crest of a wave. Any move may send the set out of CW regeneration or hurt sensitivity. What I'm seeing may be because of the tickler winding. Most references I've found indicate that the correct regen pot setting is at about 12:00. Mine is closer to 9:00...the screen voltage (and, consequently, the 1T4 gain) is pretty low when CW regeneration kicks it. Is this a problem? I don't know. The plate voltage is still the same. I'll have to wind a coil and play with the tickler winding to find out. The other limitation I found was antenna loading impact on the received frequency. Changing my antenna trimmer setting changed the frequency a lot. The solution was to add an RF stage. This won't happen. Once the C1, the bandset capacitor, is set I leave the antenna trimmer alone. The Vibroplex Original, introduced in 1905, is still being manufactured. For a few years, 1911 through 1923, the Vibroplex Model X was also sold. I've uploaded a Youtube video showing the major differences between these two models: For additional information about Vibroplex bugs see: http://www.vibroplex.com/ and Tom French's book, "TheVibroplex Collector's Guide". 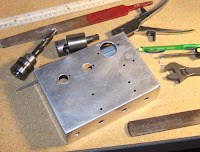 After time with chassis punches, drill press, files, nibbler .... I've gotten my chassis finished and the major components installed. The bandset and band tuning capacitors are each mounted an inch above the chassis to allow space for the National type K dial. Since getting a 3S4 QRP midget transmitter I've been thinking about building a receiver to match it. I wanted to use tubes along the same lines as the 3S4 and, at the same time, have a late 50s style. 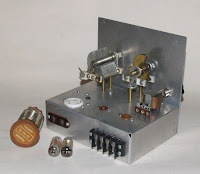 The late 50s/early 60s ARRL "How to Become a Radio Amateur" featured a two tube regen with a 3 1/2" National type K dial. That sort of style was what I was looking for. I finally found the receiver circuit at Bob's Data: Useful Electronic Data and Project Plans and I have a National Type K Dial to set the style. I've found the parts I need and have played with them to figure out a layout I like. The chassis is marked up and I'm ready to drill. A couple of weeks ago I spotted a radio on ebay that looked really interesting. I've been doing some research on it since then. This radio is a three tuber with a tuned RF stage, regenerative detector and a single stage of audio ... not unusual for an early 30s shortwave set except for the mechanical layout. All of the tubes are mounted horizontally with the RF tube projecting through the RF/Detector stage shield. This layout allows for a compact set. 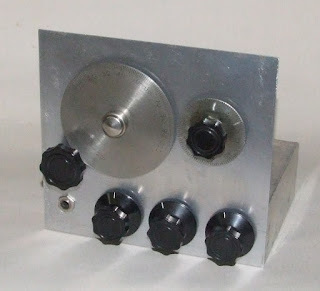 The National SW3, for example, is a three tube regen with a tuned RF stage. It measures 9.5"x7"x9". This set is only 7"x5"x6.5", less than half the size of the SW3. A search found the original described in the June 1931 issue of QST. Ross Hull designed this set to demonstrate the capabilities of the new type 33 audio pentode. He bragged about the gain of the AF stage and being able to drive a speaker to good volume. Why, then, didn't he include a volume control? You have to detune the RF stage if a station is too loud. Along the way, though, Hull did, in typical Hull style, came up with the clever mechanical layout. Hull was also an early VHF advocate/experimenter. This layout allows fairly short leads. 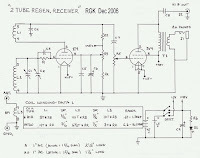 I have to wonder if he was thinking ahead to 60MHz when he sat at the drawing board designing this radio. It is warming up nicely here in SE Minnesota and the city parks are finally open. Yesterday I took my KX3 along with my 20 meter end fed zepp to Essex park here in Rochester. I didn't have a lot of action but both QSOs were neat. I finally had to QRT when the high school kids started showing up for prom photos and it looked like I might be in the background. My first QSO was with NM5S in the Magdalena Mountains of New Mexico. He was operating SOTA (Summits on the Air). I've activited a couple of summits but no 10 pointers like Alan was yesterday. Later this summer I'll probably find a summit or two to activate myself. Rockmite transceiver and a 1/2 wave vertical. He was almost 100% copy here in MN, that's 5600 miles per watt! I'm looking forward to more QRP outings to the park but next time I'll pack along a Coke and the BBQ grill so that I can make a day of it.